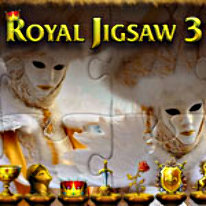 Royal Jigsaw 3 has 1000 beautiful images in high quality! There are more excellent images this time around - 1000 puzzles for you! Each image is a high quality masterpiece. The game play is still the well-designed experience you've come to expect, with useful tools and hints to help along the way. Optional game difficulty control makes your game play more interesting and comfortable. Special achievements and trophies give experts more challenge and reward! Save your progress and continue the game at any time! Choose your own settings for each puzzle, and infinite game play! Luxury decoration, beautiful landscapes, famous antiques, vintage jewelry and magnificent castles of all time... All the best for true king!